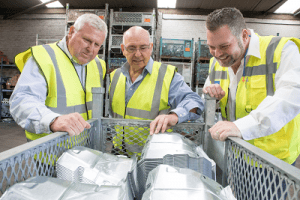 Pressmark Pressings, which provides high volume components for automotive manufacturers was bought by management team Alan Gardner, John Nollett and Les Wilkins in July last year after they spotted an opportunity to turn around one of the sector’s most under recognised businesses. Backed by their own cash injection and funding from ABN AMRO and Cambridge and Counties Bank, the trio have used their knowledge and contacts to put in place a number of new processes that has seen it secure more than £2m of additional contracts to supply pressed parts and sub-assemblies that will be used in new models for Honda and Nissan. The Atherstone-based company has already won ‘aftermarket’ work from new customers and is currently exploring a number of projects for new products from tooling design to volume production. “We had seen the potential in Pressmark for a while, but by the time we had managed to put together the MBI the company was struggling commercially and had just lost 25% of its sales due to the end of a contract,” explained John Nollett, Chief Executive and who is currently President of the Coventry and Warwickshire Chamber of Commerce. Established in 1972, Pressmark Pressings is a specialist in high quality metal pressings and resistance welded assemblies, traditionally supplying white goods and automotive although the order book is now growing to encompass industrial products and construction. On its current site in Carylon Road, the firm has 26 large bed presses, ranging from 150 to 1200 tonnes allowing for the production of different size products in both standard metals and exotic alloys. The company, which has created over 25 full time jobs since the MBI, also boasts a strong production engineering capability, working with customers on tooling design to ensure components are produced efficiently and cost effectively. “There’s a strong belief between the management that we can expand by undertaking project management of multi operation/stage work. “One recent example is how we worked with a Japanese manufacturer of complex electromechanical components that was investigating production in the UK. It was a tentative enquiry at first, but we have given them advice and guidance during the feasibility study and, subsequently, provided quotes for tooling as well as production and assembly of components. Alan Gardner, Finance Director, concluded: “If the second year continues as planned, we’ll be approaching a turnover of £9m, with the long-term aim to grow to £20m through organic expansion and possible acquisition. This is a great achievement. Well done to all involved. Thoroughly deserved!! Thank you from all the team here for your kind support along the way Lauren. It is contractors like you, that helped us achieve this.